Wales captain Jess Fishlock says her side are focusing on securing second spot as they prepare to face Group 6 leaders England in Cardiff on Thursday. England need just a point to qualify for Canada 2015 from their two remaining matches against the Welsh and bottom side Montenegro. 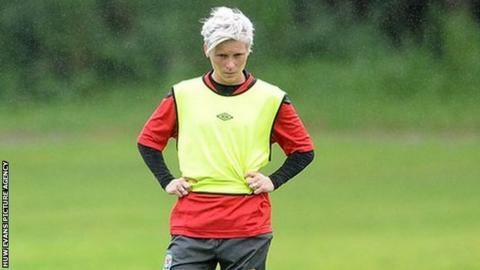 Wales are five points behind England in second, but Fishlock doubts they will be able to overtake them. "I think that we can safely say that the first place is gone," she said. England, managed by Welshman Mark Sampson, have won all eight of their qualifiers so far and have conceded just one goal during their campaign. Jarmo Matikainen's Wales, meanwhile, have not lost a Group 6 match since their 2-0 defeat to England in October 2013, winning five and drawing one. If Wales fail in their quest to finish top, another route to the finals could come through the play-offs. Four runners-up from the seven groups will go into two rounds of play-off matches for the remaining World Cup spot. Wales' final Group 6 opponents and rivals for second place are third placed Ukraine. They beat Belarus 3-1 away on Wednesday to close the gap on the Welsh to just three points. Fishlock says a point against England could prove important as they aim to become the first Welsh football side to reach a World Cup finals since 1958. "For us it is about second place and the play-offs," said Fishlock. "We are going into this game (England) knowing that perhaps if we get a result, if we get one point, that really, really makes our play-off chances huge. "We don't need to go out and win, it'd be great if we did but it's not necessarily what we need."